I just booked my flight to Phoenix today. I’ll be arriving on Sunday afternoon and leaving Wednesday night. 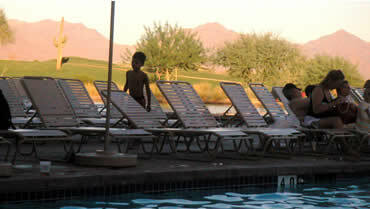 The conference is held at the excellent JW Marriott Desert Ridge Resort & Spa. A gorgeous luxury hotel with lots of pools and palm trees. Yes. Daytime highs will probably average 105 degrees. It will be scorching hot. You can’t plan on exercising outdoors during the heat of the day unless you go swimming. But, there is a nice big exercise room with a lot of machines which I managed to avoid last year. Swimming is a must. Ideally two or three times a day. The water temperature is just right – not too cold or too warm. There are a variety of pools. Water is everywhere as a compensation for how hot and dry it is. The resort is across the street from a mall which is handy for shopping, movies and a good bookstore (it’s either Borders or Barnes & Noble). A shuttle operates frequently to take you to and from the mall which isn’t a bad idea during the day unless you’ve got a water bottle and are ready for some heat. Then there’s the conference itself. They do a first class job. Presenter (and attendee) knowledge of FileMaker 7 will now be deep and full of real world experience. Three or four sessions run concurrently throughout the day with room for seven 1.25 hour sessions a day! Brain death is always a danger at these things. If you don’t like one session, you can try another or sometimes spending time one-on-one with another attendee or chatting with vendors is even more valuable. As usual we’ll be filled in on what’s next for FileMaker at the 2 hour keynote on Monday morning and, if like last year, a special FileMaker Solutions Alliance meeting for FSA members only Monday night. If you are coming and want to say hi, just leave me a message and your room number and we can find a time to meet. This entry was posted in FileMaker News on August 7, 2005 by janet.